I am practising adding images to this blog. 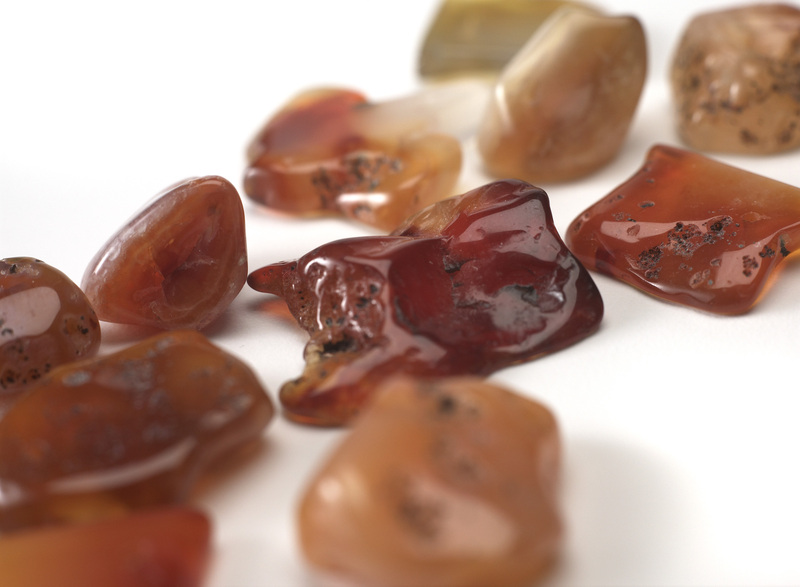 The gemstones pictured are Carnelian. This is a wonderful stone that comes in a variety of shades tending towards rust and autumn colours. There will be new images in the Gallery as well. My new collection features chains embellished with gemstones and pearls and coral-any of those or even a combination. Earrings are more dramatic. I was just able to gather some wonderful smoky quartz and onyx of high quality from Fancy Gems and Accessories in Toronto. The gemstones in this shop are outstanding and some of the best that I have seen anywhere. Owner Jill Chang has had a lot of experience with jewellery and gemstones and knows what she is doing and certainly how to buy. Her choices are exquisite. A reminder that May 24 and 25, I will be in the Distillery District in Toronto for their Artisan Show. Check the link! I should mention that although most of the pieces in the Gallery are sold, I have them there so that you may see the variety of the pieces that I create. If something appeals to you, do get in touch and I will create a similar but not identical piece. The turquoise and obsidian necklace is now also sold. I will be exhibiting in the Distillery District in Toronto on May 24 and 25. (check my Events section and also Links). The Artisans’ Craft Show is an outdoor show held at the same time as The Open Door event in Toronto. So well worth a visit to this most engaging area. Many interesting boutiques, galleries, restaurants, pubs, coffee houses-plus of course all the artisans who will be displaying their creations–including me!! I have 2 events now in May and my fingers will have to get very busy! Do get in touch if you would like to have a preview of my pieces. New ones coming all the time! Spring Open House-Day 3-AKA-Storm Day!! What an amazing three days-weather-wise and jewellery-wise! The storm was in full swing yesterday and yet a few hardy souls trekked to my front door. Two sisters always meet for breakfast on the week-end and a storm wasn’t going to stop that tradition. After breakfast they stopped in. The sister who had not visited my studio before was very delighted that she was talked into this stop. So was I. Another woman had shopped for groceries and decided to stop in and do some fun stuff-i.e. try on some jewellery-which she did and it was fun!! Thank you everyone who stopped in. It was a successful event for me and I will repeat this next year at the same time. My next confirmed event is the BEYOND THE VALLEY STUDIO TOUR- Saturday, May 31 and June 1. My studio will again be open again and this time I will have Colleen O’Reilly-Lafferty, a ceramic artist as my guest. She was here for the October 2007 Studio Tour as well. Her work is renowned for its luscious colours and fabulous shapes. She creates tiles, vases, dinnerware to mention a few things and one of my favourites is an oval flower pot/vase with a lid that serves as a frog to hold stems. It is absolutely wonderful, especially with tulips, and as soon as I saw one I had to have it. And now I do!! Check out her website and you will be amazed by her wonderful work. Currently her studio is at 328 James St. N. and is part of the Art Walk every second Friday of the month. I am very pleased that she will be here for the tour because I love to see her beautiful work but I also love to spend time with her–she is a lot of fun!! You will enjoy meeting her if you haven’t met before. Spring Open House-Day 2-The Storm is coming!! The second day of my Open House started with a good number of visitors until about 3 p.m. Then the snow started and it seemed over. I was still quite happy as the day before had been so busy with lots of visitors and good sales. Then at about 5:30, amazingly, more visitors-in spite of the snow. How gratifying it was to receive them and a lot of fun. There was time, and it is important to have time, to try on different pieces and discuss how the jewellery can be worn. My chains often can be worn in 2 to 3 different styles. It is important for you as a buyer to make time and try on pieces, even ones that you like but think might not suit you. Because sometimes and unexpectedly a piece of jewellery that you might not normally wear, does after all make you look fabulous. I have heard many a woman say “I only look good in dainty pieces!” or “I don’t wear large pieces-I am too small”. This is not always the case so do listen to the designer who suggests something that could work for you. We look at colour and shape (yours and the jewellery) and don’t be reluctant. Keep in mind that the necklace or earrings or bracelet or pendant should make you look beautiful. You wear the jewellery-it shouldn’t wear you! One woman was drawn to and looked wonderful in large dramatic pieces in black and bright colours. Yet she also chose a smaller necklace made up of smoky quartz (brown) tears embellished with turquoise crystals. It was another look, softer, that also enhanced her appearance. One advantage of attending an in studio sale is that much trying on is encouraged and there is a lot of discussion and personal attention-so don’t be afraid to experiment! I think that many people would not believe it considering the abysmal weather that we have been having. Snow again!! This was the first day of my Spring Open House and I am delighted to say that it was a very happy event. In spite of the overcast and miserable weather, many came out to view my spring collection. Thank you each and every one for taking the time to do so. I loved hearing the compliments and positive comments. I continue to be amazed at the response to my designs. I should mention that I now have in my collection of loose stones, matte onyx in wonderful shapes of open ovals, rectangles, small and large squares. I have already made up a long sterling silver chain necklace of open carnelian squares and open matte onyx squares with silver embellishments. It is a dramatic piece. As well I have made up pendants of onyx with pearls, copper and venetian glass for decoration. Stunning if I don’t say so myself. It will be interesting to see how Day 2 and 3 turn out as we are expecting a major snow storm. I did hear a cardinal sing today-optimistic bird!! Even my grandson is tired of the snow and wonders when he can stop wearing snow pants-not soon from the looks of it. This is of course great for skiers as March Break is starting tomorrow, but for the rest of us–begone Old Man Winter! !